ENTER THE EXECRATION, WHERE THE DAMNED AND THE DESPERATE COME TO PRAY TO THE MAD GOD… It is two hundred years since the deity known as the Absolved went mad and destroyed the Kingdom of Alnachim, transforming it into the Execration, a blasted wasteland filled with nameless terrors. For decades, desperate souls have made pilgrimage to the centre of this cursed land to seek the Mad God's favour, their fate always unknown. Now a veteran warrior known only as Pilgrim, armed with a fabled blade inhabited by the soul of a taunting demon, must join with six others to make the last journey to the heart of the Execration. Allied with a youthful priest, a beast-charmer, a duplicitous scholar, an effete actor and two exiled lovers, Pilgrim must survive madness, malevolent spirits, unnatural monsters and the ever-present risk of treachery, all so that the Mad God might hear his prayer and, perhaps, grant redemption. But can sins such as his ever be forgiven? 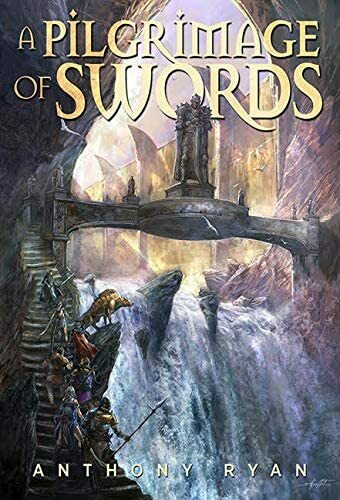 Set in a world where demons and gods walk the earth, A Pilgrimage of Swords is a dark and exciting fantasy adventure from the New York Times bestselling author of the Raven's Shadow and Draconis Memoria trilogies.